When we pass the food at our family table, we share laughter, allow transparency, and extend grace. Inspired by the slow food movement, Come to the Family Table seeks to inspire families with intentional strategies to engage one another in their walk with Christ. It’s all here—encouragement, instruction, devotions, activities, and recipes so your family can slow down and enjoy one another and Jesus. When we eat and drink together, we pause and remember that the Lord provided it all. 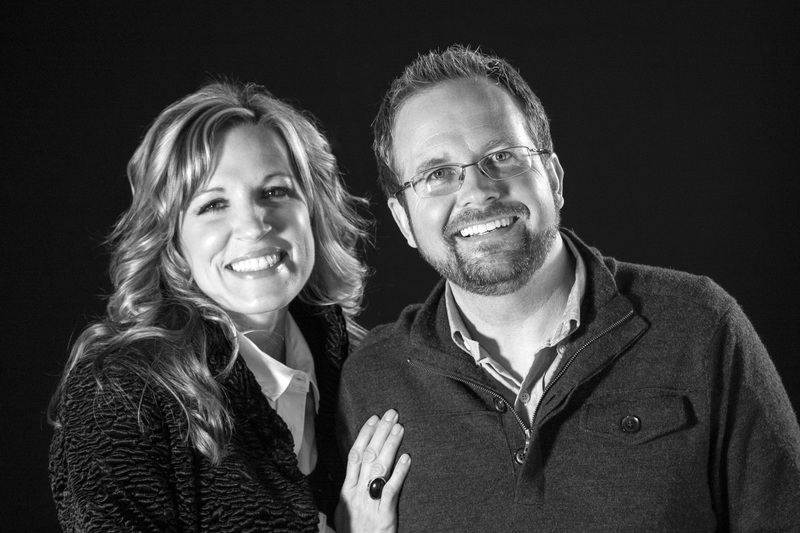 Ted and Amy Cunningham founded Woodland Hills Family Church in Branson, Missouri, in 2002. Ted is a popular speaker and prolific author of marriage and family books, including Trophy Child. Both Ted and Amy are graduates of Liberty University, and Ted is a graduate of Dallas Theological Seminary. The husband-and-wife team are authors of The Power of Home 90-Day Devotional: Building a Strong Family Day by Day. They live in the Ozarks with their two children. Ted and Amy Cunningham have written the perfect antidote for the busyness of everyday modern life. Come to the Family Table provides encouraging devotionals, interesting questions, and recipes as a way to bring your family together over a mail. If you’re looking for a way to increase the conversation and the laughter in your house, make sure this book makes its way onto your dinner table. Do yourself a favor and devour this book like you would your favorite meal. It’s an amazing read! Thank you, Ted and Amy, for providing insight into family, love, relationships, food, fun, and laughter. You have filled these pates with great content, recipes conversation starters, and devotions … it literally has it all. This book is an excellent tool for any family that wants to move in the direction of health. Thank you for blessing my family and our table time. This is a gift that will serve to many. Well done! Ted and Amy Cunningham offer us a challenge to return to a time when “dinner time” was not just about quickly downing thee food but about relaxing together as we connect with friends and family. Come to the Family Table is a must for every newlywed couple as they anticipate building a rich life together. Filled with creative ideas, recipes, and ways to foster discipleship and intimacy as a family, this book invites readers to give attention to how they are nurturing those closest to them. Ted and Amy teach with ease that intentional hospitality–integrated with simplicity and love–is vital as we seek to leave a lasting footprint in the lives of those we invite into our homes. We all know food impacts the body. Ted and Amy Cunningham make a compelling and deeply personal argument that food can impact your family and even your soul. They will show you how gathering around the table as family and friends might not just be good for you–it might even heal you. This is a fascinating read. How thrilled would you be to find a $1,000 bill under a napkin at your kitchen table? Come to the Family Table will fill you with warm feelings of belonging and help you build rich memories with your family. Consider this book permission and energy to enjoy what we should never have lost–joy around meals and hospitality that makes sharing Jesus way more natural. Our families deserve to much more than what they get in this hurried, food-for-fuel world. This book rocks when it comes to reviving hope, fun, and virtue in our busy families. Ted and Amy are two of my favorite foodie friends. There is probably no better way to experience community than around a common table. Come to the Family Table gives a very practical way to create intentional shared experiences with your family. This book is #DateNightWorks approved and will keep you and your family laughing and loving at every meal. One of the highlights of our day is sitting down together as a family of six for dinner. With four boys, most meals are filled with energy, laughs, and loud noises, but not a lot of intentional conversation. 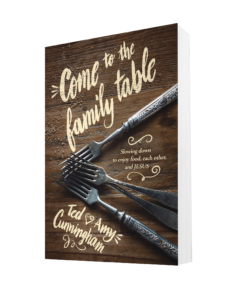 Come to the Family Table by Ted and Amy Cunningham reminds us of the value of making memories and raising disciples together around our kitchen table. This book will help you transform the way you view the precious times you have together with your spouse, kids, friends, and family. In our fast-paced, go-go-go culture, Come to the Family Table will challenge the way you view food, meals, and even time with your family. The book is based on God’s word and is practifal, creative, a ready to be applied! If the kitchen is the center of the house, then the dinner table is the heart of the home. In Come to the Family Table, Ted and Amy Cunningham remind us that part of being a healthy and intentional family is regularly gathering together for meals. Wise parents prioritize “table” opportunities to build into their children as well as reach out to others. Come to the Family Table presents a practical, biblical, intentional, and fun approach to loving your family and friends. A simple book with a powerful message. Every family needs to come to the table. Ted has been a champion for marriage and family in the church for years. Now he brings it home to the family table. The book is a great blend of wisdom, stories, games, recipes, and simple tips to make deep connections with family and friends. It’s a book everyone can engage with–the kind you would want to take on a family road trip or read out loud around the fire on a holiday. I wish someone had encouraged me to spend more time at the family table when we were raising our kids. I highly recommend this book! The format is engaging and easy to follow. Each chapter has compelling and simple illustrations of ways to incorporate the family table into real life. Best of all, Ted and Amy speak to the heart, reinforcing what is good at home and stirring up what can be even better.